There are several items commonly found in many households that are toxic or dangerous to pets. Make certain that these items are removed from areas the pet has access. In these cold winter months also remember to dress your pet for the outdoors or restrict outdoor time. If the pet is kept outdoors make sure to provide shelter and warm animal quickly if becomes too cold. Also, always remember to keep your veterinarian's phone number handy along with the number to the nearest 24 hr emergency clinic. These tips will help ensure you and your pets have a safe and wonderful holiday! Follow these tips to prevent your pets from climbing the tree, knocking it over and also breaking holiday ornaments. Some plants used for decoration around the holidays could be very harmful to your pets. The following plants should be kept out of reach: The biggest reason for E.R. visits with your pet during the holiday season is ingesting the wrong foods and/or harmful objects. Here is a list of problem foods and objects to watch out for: Try to maintain a normal schedule with your pets. Keep regular mealtimes and diet and remember walks, exercise and playtime will keep them out of trouble. Also, make sure you have a safe place for them to escape if the visitors are too much for them. This could be a separate area of the house, a kennel or crate, and sometimes boarding them overnight can help make them more comfortable. Many people have more than one companion animal sharing their lives and their homes. As a result, questions arise as to the best way to introduce a new animal to resident household animals. Each introduction will be different depending on the species (dog, cat, etc. ), the number of other animals, and the ages, sexes and individual temperaments of the animals involved. Despite these complications we have a few suggestions that may help to smooth the transition of a new animal into your household. A general rule of thumb is that unfamiliar animals should never be left together unsupervised to “work things out” on their own. First impressions are important to animals as well as people and if things start out badly, the animals may never get along. Once you get the new animal home, confine her/him in a comfortable space (spare bedroom, cage, etc.) where she/he can be visually isolated from the other household pets but can begin to get accustomed to the new home. From time to time you may want to isolate the other animals and let the new animal explore the rest of the house without the other animals present. Introductions between new and resident animals should be as pleasant as possible. Watch closely for signs of fear or aggression and separate animals if this occurs. Use food treats or toys to reward non-fearful and non-aggressive behavior and to keep the animals in a happy, pleasant mood. Restrain the animals at first with leashes or by holding them near you. Animals that aren’t moving around freely are less likely to cause fearful or aggressive responses in others. Additionally, fights are easier to break up among restrained animals. Make initial introductions brief (5-10 minutes) but let them go longer and give the animals more freedom with each other as they become more relaxed around each other. Don’t be tempted into leaving the animals together for long periods of time if the first few short introductions go well. Gradually work up to longer periods. Don’t punish animals for threatening each other or fighting. Simply remove them from the situation. The punishment may make them more aggressive with each other in the future. Be patient. Several short introductions over a several days or weeks works better than a few longer sessions. If the animals haven’t been fully integrated within a week or two you may need professional help. Taking the extra time and effort in the beginning to insure that relations start off well may prevent fighting problems later that can be dangerous and difficult to resolve. As with most other behavior problems, prevention is the best medicine. Source: Rocky Mountain News, Denver, CO.; Daniel Estep, Ph.D. and Suzanne Hetts, Ph.D. Protect your Dog against Heartworms, Roundworms and Hookworms. How can you do that you ask? Just give them their monthly Heartgard chewable tablet year round. Heartworm disease is a serious and potentially fatal condition caused by parasitic worms that live in the heart and possibly the lungs. *How does a dog get heartworm disease? They get heartworm disease by a single bite from an infected female mosquito. There is no way to tell which mosquitoes are infected, which is why heartworm prevention is very important. After an infected mosquito has bitten a dog, it takes about 7 months for the larvae to mature into adult heartworms. * How will I know if my dog has Heartworm disease? You can find out if your dog has heartworm disease by bringing your pet into the clinic and doing a simple blood test every year. *Once my dog had been diagnosed with heartworm disease what is the treatment? Usually it is treated with a series of an injectable arsenic-based product. After treatment, the worms begin to die. As they die they break up into little pieces, which can cause pulmonary blockages causing death if you don't keep your dog quiet during the several months of treatment. *Can people get heartworm disease? What about if one of my pets has Heartworm disease can my other pet get it? It's a specific parasite that only affects dogs and cats and other mammals. 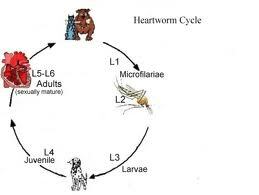 In very RARE cases heartworm has infected people, but it can't complete its life cycle, therefore causing no harm. As far as pets giving it to each other, they CANNOT pass it on; it can only be transmitted through a bite of an infected mosquito. *Can I skip giving my dog his Heartgard during colder months? No. Along with the American Heartworm Society, we also recommend year round heartworm prevention. Heartgard, Interceptor, Sentinel and Revolution don't just protect your pet against heartworms, but they also protect your pet against other parasites. When taken on a monthly basis Heartgard is effective in preventing internal parasites such as roundworms, hookworms, and whipworms. This will also cut down on people forgetting to give their pet their monthly Heartgard. Now, if you use it year round, and you miss a month, your pet will probably still be protected. If you miss more than one month your dog could have a higher chance of getting infected. Some adult mosquitoes become inactive with the onset of cool weather and enter hibernation to live throughout the winter. Some will lay hardy eggs that can survive through the winter and hatch in the summer. Other kinds of adult female mosquitoes mate in fall, hibernate through winter in animal burrows, hollow logs or basements, and then in spring, lay their eggs that will produce the next generation of mosquitoes. *Can I get internal parasites from my pet? YES. Roundworms, hookworms and whipworms are a zoonotic disease, which means your pet can pass it on to you and your children. Internal parasites can be passed from mammal to mammal even in winter months. *Can my cat get heartworm disease? He/she is only an indoor cat and never goes outside? YES. Cats that are indoors may actually be at a higher risk than cats that 'go out'. In fact, up to 33% of reported cases of heartworm positive cats, are reported by owners who describe their cats as being "strictly indoors". Heartworm disease is often more severe in cats than dogs, so it's just as important to give them their monthly dose of heartworm prevention as it is your dog. Click here to see Summer tips for your pets!